I hope you all enjoyed a lovely weekend!!! I’m excited to share this new quilt finish with you all. I have been working on this echino Punch Quilt for quite a few months now. Happily I finished on a weekend that provided sunny skies and warm temps. Perfect for some outisde photos! 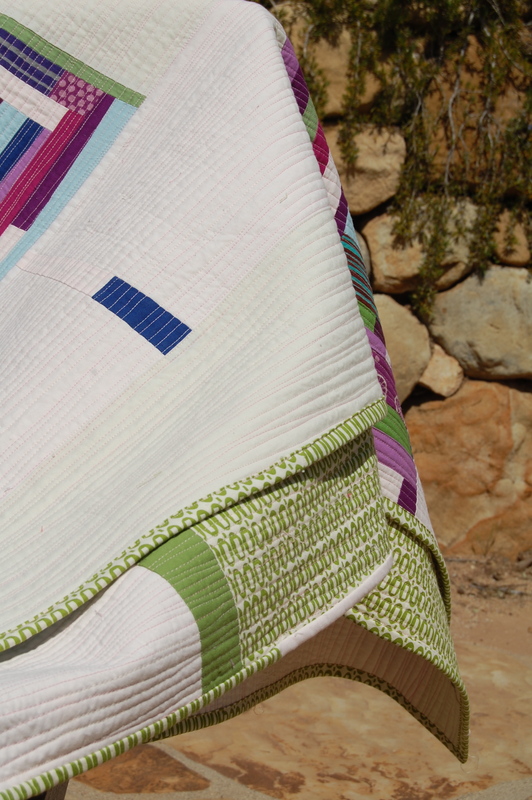 not to mention, a gazillion spools of thread; much like with this quilt, so I knew what I was in for when I started. 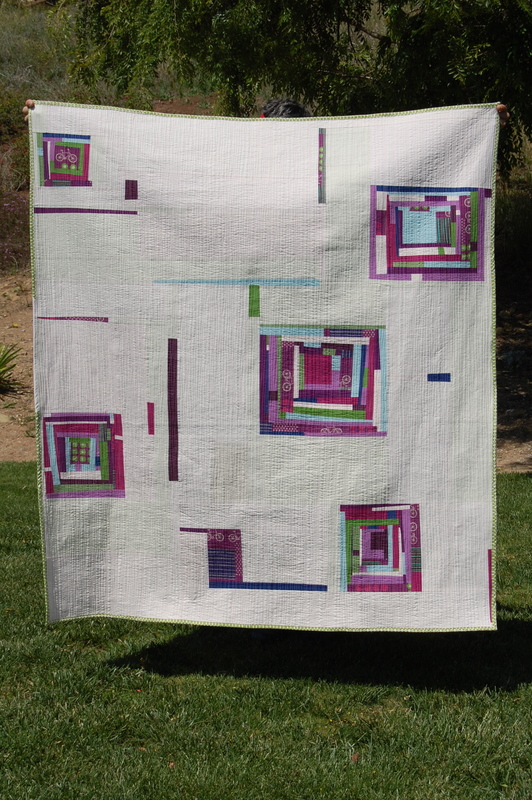 I chose a variegated pink thread color that sort of mimicked the colors in the negative space of the quilt, and was really happy with the results. 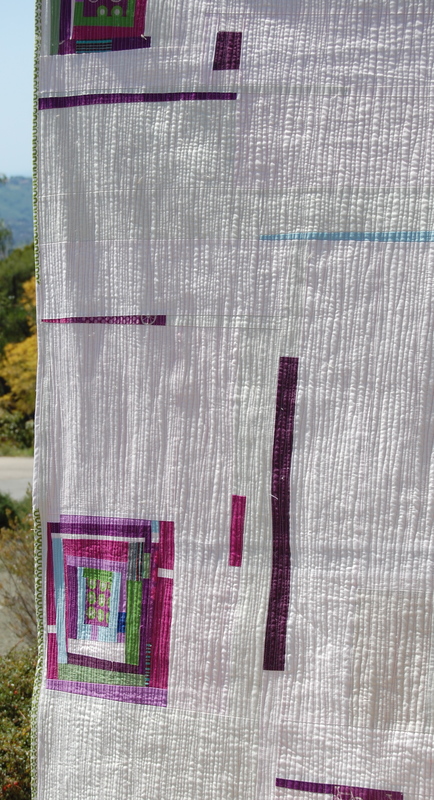 It’s always interesting to me how quilting lines and binding can really transform a design. 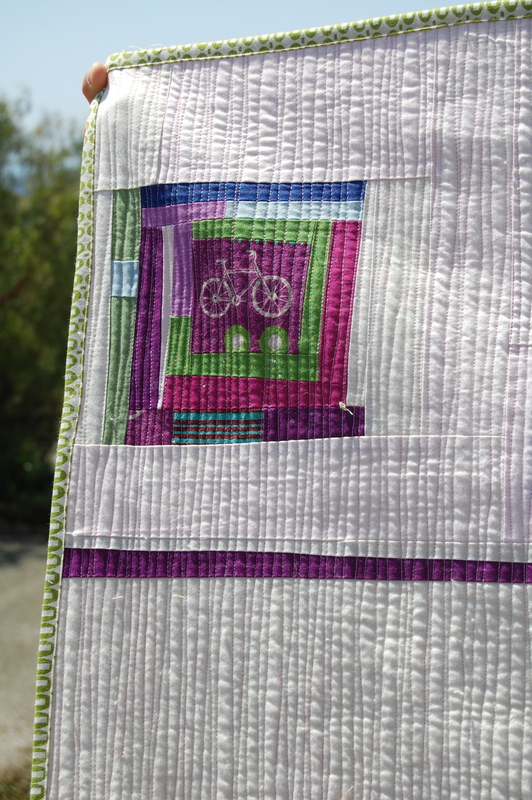 I was sort of “so-so” about this quilt during the design and basting process. But when it all came together, I was quite pleasantly surprised! I loved the Moda Pezzy Print so much that I decided to use it for the backing,(along with a few random leftovers) and the binding. I think it made for quite a “zippy” little (about 58 x 64 inch) improv quilt!! 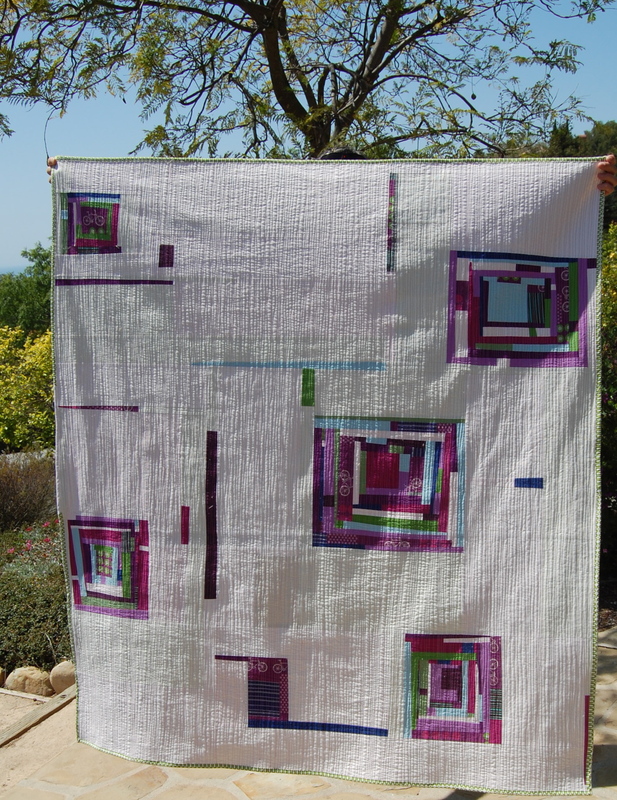 This quilt reinforces to me how much I enjoy improv piecing! The most difficult part of this type of design is filling in the negative space in between and adding the “tidbits” of color. 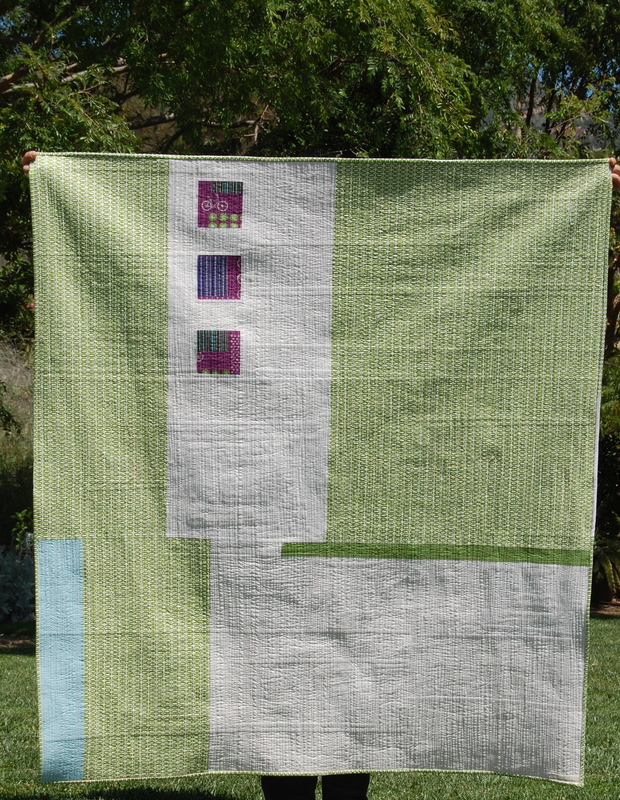 For this quilt I chose to use very subtle variations in tones for the negative space. I used Kona Bone or Snow? and I think Pearl Pink? For the blocks I used a variety of mostly darker Kona solids and of course echino bicycles that I picked up at Superbuzzy. I’m not sure yet where this one will end up, on the back of our couch, on a wall in the living space or bedroom, in my very lonely and empty shop…..hhmmm?? Our oldest daughter Miss K just might want to “adopt” it, she seems quite smitten with it. Perhaps it’s all the pink and purple!! Colors Mamma doesn’t use too often. I’m linking up this post with Sew Modern Monday over at Canoe Ridge Creations. Go on over and take a look at all the other modern, quilty/crafty goodness over there if you have a few minutes. Oops, no linky party today after all! Have a lovely and creative week!! it is fantastic!! the improv and the quilting both are just great!! Gorgeous! The quilting is fantastic and just perfect. Love it!!! Absolutely beautiful! The colors are great and the details amazing. You did it again!!!! Love this quilt!! The quilting is perfect, although I’m sure it too forever. It was definitely worth it. I love your combination of line, form, shape, color, and texture. A perfect balance. I particularly love the textures you are getting. Absolutely beautiful! Wow! Wow! Wow! Love it! Love it! Love it! Where to begin? The fussy cut bicycle? The improv log cabins? The purples, blues and greens? And those slivers of color here and there? But my favorite part is the quilting! I know that took forever, but wow! Love this quilt. I can only imagine how long the quilting took. lovely. the quilting is stunning! the effect is so beautiful, i wish i could touch it! Karen: this is amazing! 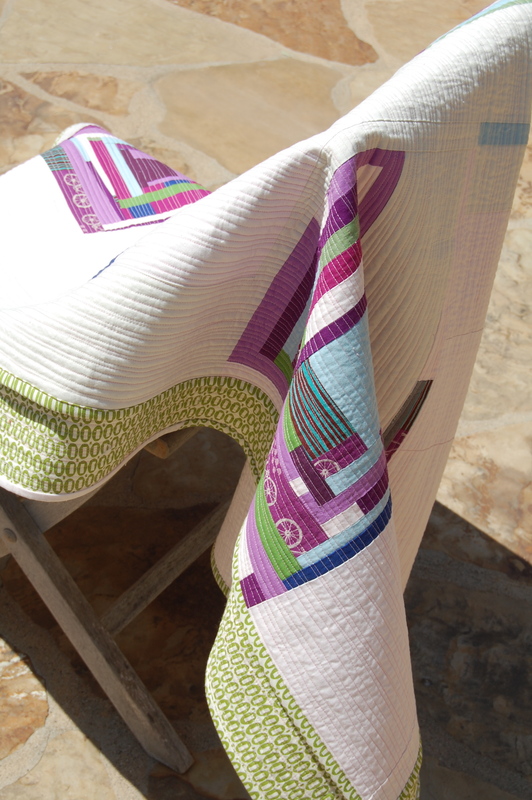 Echino can be a bit challenging to use in a quilt, but you’ve shown how successful the line can be! And, I know i’m late to the party, but congratulations on your quilt’s acceptance to the show! Can’t wait to see it in person myself… hope to see you soon! Wowza! I LOVE it. I know what you mean about the thread! went yesterday to superbuzzy and was greeted by your gorgeous quilt. i am completely smitten! 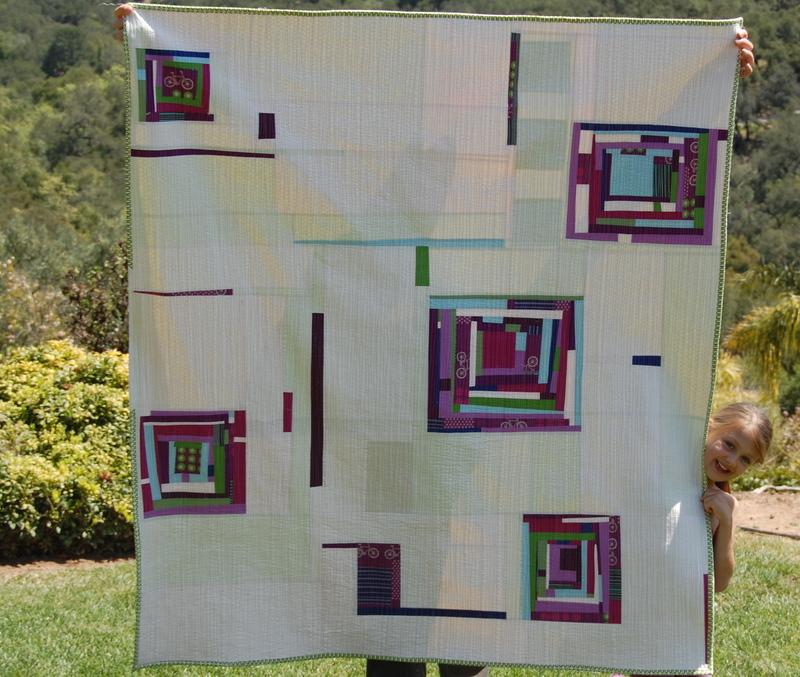 it never crossed my mind to try my hands on quilting until i saw your stunning piece – thank you for the inspiration!